Chronicling a day in the life of Quick Stop clerk Dante Hicks, Clerks captures the hilarity of the humdrum even as it raises slackerdom to existential proportions. From behind his counter, Dante desperately tries to exert some power over the crazy customers, his own love life, and his incorrigible friend and fellow clerk Randal - the type who sees nothing wrong in closing the video shop he works in to go rent movies from a better store. Okay, I admit it: sometimes I might ever so slightly display the teeniest tendency to be close-minded about some things. Case in point: when Kevin Smith burst on the scene with indie hit Clerks in 1994, he immediately became the darling of the hipster set. MTV even incorporated some of his characters for promos. Obviously, compared to the hype of mega-movies like The Phantom Menace or Harry Potter and the Sorcerer’s Stone, the buildup that surrounded Smith and his movie was almost negligible, but there was something about that "next big thing" attitude that turned me off and I never gave Clerks - or any of his subsequent films - a shot. Until 1999, that is, when I decided to give the then-new DVD of Clerks a look. Long weekend, five-day rental, special edition - what the heck, let's give it a shot! Clerks turned out to be a pretty funny and entertaining little movie. It's definitely not would you'd term an "epic;" all it purports to do is show a typical day in the life of some early-20s "slacker" types as they deal with the various issues that affect them - mainly women and crummy jobs. Actually, far too much happens during this workday for it to appear truly "typical" - our main character, Dante (Brian O'Halloran), more actively debates his romantic choices than would be usual - but most of the film's humor stems from the slightly warped portrayal of the strangeness that we encounter on such a frequent basis. That's the area in which the film really shines. It doesn't attempt much of a plot - Dante's attempts to work on his love life make up the movie's most consistent theme - but it more than makes up for any story deficiencies through wittiness and incisive (though broad) characterizations. Clerks is definitely a film in which the whole is much greater than the sum of its parts. Taken on their own, various aspects of the production are pretty weak. The acting largely smacks of community theater quality, the story basically doesn't exist, and it lacks any vague form of production values. The whole thing looks cobbled together in some guy's spare time - which, essentially, it was. The movie's about store clerks, for God's sake! What less interesting premise for a film could there be? Still, the project possesses a strong spark that makes it compelling. Smith seems to have a good ear for dialogue; it isn't always incredibly witty or insightful, but it's real, and that's what makes it entertaining. It's the old "it's funny because it's true" deal; although the movie definitely presents its characters and scenarios in a broad manner, there's enough realism to make the picture compelling and interesting. To be honest, I found it tough to write this review because it seemed so hard to pin down what it is about Clerks that makes it entertaining. It's not a world-beating movie, and you're probably not going to spend hours discussing its details with your friends, though you might quote its lines endlessly. The acting varies between flawed but entertaining (Jeff Anderson as Randal) and atrociously wooden (Marilyn Ghigliotti as Veronica, who always seems to struggle to remember her lines). However, part of its appeal lies in the fact that it's something different and that it knows its strengths; Clerks never attempts to be more than a small, affectionate study of a certain kind of person at a certain point in their lives. It's not an all-time classic, but it's a great deal of fun and I'm sure it'll stand up to repeated viewings; this seems to be one of those movies that can offer different experiences at different times. Clerks appears in an aspect ratio of approximately 1.85:1 on this single-sided, double-layered DVD; the image has been enhanced for 16X9 televisions. When I reviewed the original DVD release of Clerks, I cut it a lot of slack due to the film’s low-budget origins. This new version finally got the flick a fresh anamorphic transfer, and it validated my prior opinions, for while the 2004 DVD presented a stronger image than the old one, the improvements seemed minor because of the source’s inherent weaknesses. For the most part, sharpness appeared adequate. The original photography occasionally rendered things somewhat indistinct, but not to a terrible degree. The movie retained a fairly decent sense of definition. One area in which the anamorphic transfer improved on its predecessor related to jagged edges and shimmering. Those caused some distractions during the old version but not here, though I continued to note a little edge enhancement. Unsurprisingly, source flaws remained an issue. Due to its 16mm origins, grain became very heavy, and I also noticed some other few defects. Specks and other marks popped up sporadically throughout the film. These decreased from the prior version, as this one was definitely cleaner, but it still had more than a few flaws. Black levels looked pretty nice and deep, but contrast appeared erratic. The film usually looked either a little too bright or a bit too dark. This issue seemed somewhat improved here, though, as the contrast problems weren’t as noticeable. I felt pleased with the new transfer of Clerks, for I think it did about as much as it could with the source material. As such, I bumped my grade of “C-“ for the old DVD up to a “C+” for the new one. It definitely presented improvements, but the inherent flaws remained too substantial for it to deserve anything higher than that. I also thought the Dolby Digital 5.1 soundtrack of Clerks was an improvement on the Dolby Surround mix of the original, but not an enormous one. The mix essentially remained monaural except for the stereo music, which displayed good delineation and spread. The songs popped up cleanly in the front speakers and also spread nicely to the surrounds. Otherwise, the audio hewed closely to the center and didn’t spread out much. Some very minor ambience popped up at times, such as with wind on the top of the roof or the rumble in the car. I thought a few more environmental bits cropped up this time, such as some localized elements within the convenience store. The scope remained very modest, though, so while the new mix seemed to open up the spectrum a bit, it still focused heavily on the center. At least this one appeared to lack the vocal bleeding that occasionally marred the old mix. Audio quality was also moderately improved. Speech usually seemed decent, though the lines could come across as brittle and edgy at times. Some weak dubbing also marred the presentation. Effects played a minor role and seemed passable. They failed to present much range and came across as thin and puny much of the time. Music seemed a bit stronger. The songs were brighter and more dynamic, though not radically so. I also didn’t notice the hiss and hum that caused distractions with the old mix. Nothing about the audio of Clerks sparkled, but as with the picture, I felt the reworked soundtrack deserved a bump from the original’s “C-“ up to a “C+”. While the old Clerks DVD featured a pretty average set of extras, the new one presented a much more definitive collection across its three discs. Some of these repeat from the original DVD; I’ll note them with an asterisk. Smith dominates the commentary as he mostly either points out who certain cast members are and mentions flaws in the film. He also tosses in various production notes such as casting and props. The other participants mainly answer his questions, and we also get some story notes and indications of cuts made for the final product. A poorly-recorded affair, it can be tough to hear some of the folks, which makes it a difficult listen at times. The track also often meanders and rambles, so it can seem tedious; it’s one of the most low-key group tracks I’ve heard. Commentaries for other Smith films are excellent, so this one remains an only sporadically worthwhile disappointment. It does reveal, however, that Jason Mewes may not have had to do much actual acting in his role as dopey druggie Jay. Next we get an enhanced playback track. Otherwise known as a trivia track, this one uses the subtitle stream to sporadically present information about Clerks. It tells us general notes about Smith and the other participants, tidbits about the film’s reception and success, connections with other Smith efforts, definitions of the chapter titles, and trivia and goofs in the movie itself. These seem moderately interesting but not great, and more than a little overlap occurs with the commentary; if you listen to that piece while you watch the EPT, you’ll occasionally get the same information at the same time. Also, more than a little dead space pops up, as much of the movie passes without text. It’s worth a look if you’re watching the movie anyway, but don’t go out of your way for it. When we head to the Lost Scene, we get a curious piece. As explained in an 82-second intro from Smith and Mosier, the original script included a sequence inside the funeral home but they never shot it. We then get a cartoon version of this scene, done in the same style as the Clerks animated series. Smith thinks that what we imagined happened during the funeral is more horrifying than what he wrote; he’s wrong. It’s a surprisingly dark piece that has some laughs nonetheless. We can watch the scene on its own or integrated into the movie. This uses seamless branching but does so awkwardly; a distinct pause occurs when the film goes to and from the animation. Never mind that the material is in color - and a cartoon, of course. It’s cool to have this option, but I can’t imagine anyone will really like it as more than a curiosity, for it badly breaks the flow of the movie. Next we get The Flying Car. In a 124-second introduction, Smith tells us about the origins of the 2001 short film. We then see the flick, and it lasts six minutes and 10 seconds. It features O’Halloran and Anderson in character as Randal and Dante, which is why it pops up here. It’s a simple piece in which the two talk while stuck in traffic, and it’s clever and funny. After this we find eight MTV Spots with Jay and Silent Bob. As always, we start with a six-minute and 37-second intro from Smith and Mosier, who fill us in with the background on these pieces. The clips themselves go for 11 minutes and 15 seconds total as they offer comedic interstitials to go between videos. They range from very funny to passable and come as a welcome bonus. DVD One includes the *theatrical trailer and a Soul Asylum *music video directed by Smith. The trailer presents the same spoken intro from Smith found with the old DVD, but the video gives us the director and Mosier in a new 95-second lead-in clip. The trailer isn't as good as Smith seems to believe, but it's still effective. The video is kind of fun - it includes the actors and characters from Clerks as well as the band - but it's nothing remarkable. Still, it's more creative and entertaining than the average music video. Three elements pop up in the Clerks Restoration domain. “Restoring the Clerks Sound with Scott Mosier” goes for five minutes and 14 seconds. He offers a good recap of the film’s audio history and what they did to improve it (as much as possible) for the new DVD. “Restoring the Clerks Look with David Klein” goes a mere 35 seconds as the DP provides a very rudimentary statement about the new transfer. Lastly, “Introduction to the Theatrical Cut with Kevin Smith and Scott Mosier” takes seven minutes and one second. Smith rambles about how the movie looks and sounds better but is still the same flick, and then he visits with Mosier as the latter works on the audio. It’s even looser than usual, which makes it funny. Next we get a collection of Original Auditions. These come for Brian O’Halloran, Jeff Anderson, Marilyn Ghigliotti, and Ernest O’Donnell. The standard Smith/Mosier introduction takes two minutes, 49 seconds to set up these clips, and then we see 11 minutes and six seconds of auditions. Lots of bad acting shows up here, which makes it awkward to watch at times but nonetheless a cool addition to the package. DVD One opens with some ads. We get a general preview for Miramax films plus a specific promo for Jersey Girl. These also appear in the Sneak Peeks area with trailers for Jay and Silent Bob Strike Back, Chasing Amy and the Clerks animated series. For the final component of the first disc, we get some DVD-ROM materials. These repeat the text commentary from the main part of the disc and add a screenplay viewer. That lets you watch the movie along with the first draft of the screenplay. I stress that it lets you do so; my crummy computer craps out when I try to watch video through the Interactual Player, so I can’t get this to work. It sounds cool, though. As we go to DVD Two, we find The First Cut of Clerks. Presented fullframe with stereo audio, this appears to come from a videotape source, and it looks pretty bad. This version runs 104 minutes, which means it extends the theatrical cut by about 12 minutes. That amount surprised me, for as I watched the First Cut, it didn’t seem like it included significant extra material. Almost all of the additional shots came from extensions of existing scenes. For example, we got more of Jay and Silent Bob’s introductions, and Dante’s first chats with both Veronica and Randal now last longer. The First Cut also used different inserts and cuts. The most significant change came from the alternate ending. I won’t reveal it other than to state that boy was it inappropriate! It would have been radically out of place in this film. (To avoid it, don’t pay too much attention to the DVD Two main menu, which reveals it.) The theatrical version of Clerks remains superior, but it was cool to see this First Cut. This cut of the film comes with its own audio commentary. It presents remarks from Smith, Mosier, O’Halloran, Mewes, and actor Jeff Anderson. All of them sit together for their running, screen-specific chat. They discuss topics such as experiences each went through due to the success of the film, its low-budget creation, and the changes between this cut and the final one. Actually, we don’t hear much about that latter subject, which seems odd. Instead, the piece takes on mostly an anecdotal flavor, which provides some of its best moments. The story about Mosier seeing Smith’s mom naked is particularly amusing. Otherwise, this track seems just as lackluster as the original one. The guys eat during much of the discussion, which becomes annoying, and it often drags. I find to tough to remember much substance or entertainment value behind what they say, which is the mark of an ordinary commentary. A few decent elements emerge - like details of how Anderson fell in love on the set - but this remains a bland track. For the more daring among you, this piece can also be viewed as a video commentary. With this activated, the movie occasionally branches off to show footage of the men in the studio. It seems pretty pointless to me. Finally, DVD Two includes an introduction from Smith and Mosier that runs when you start the movie. It runs eight minutes and 41 seconds as they BS about the Patrick Swayze clunker Roadhouse for a few minutes before they give us some info about the alternate cut of the movie. It’s funny and useful. Now we move to DVD Three and all its components. The main attraction comes from a new documentary called The Snowball Effect. In this 90-minute and 25-second piece, we get a general look at Clerks and Smith’s life and career. We get movie clips, archival materials and interviews. We discover notes from Smith, Hapstak, Mewes, Pereira, Mosier, Klein, O’Halloran, Anderson, his mother Grace, friends Ernie O’Donnell, Mike Belicose, Bryan Johnson, Walter Flanagan, writers Peter Broderick and Amy Taubin, producer’s representative John Pierson and his wife Janet, independent film consultant Bob Hawk, Miramax’s Harvey Weinstein, Mark Tusk and Jon Gordon, Sundance Film Festival director Geoff Gilmore, and actors Marilyn Ghigliotti, John Willyung and Joe Bagnole. 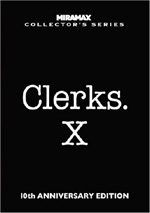 “Snowball” covers the gamut of Clerks-related topics. It goes through Smith’s early life and his family, formative experiences and school, early writing and live comedic performances, post-high school friendships and development, real-life antecedents to the material in Clerks, jobs, cinematic influences, Smith’s movement into filmmaking, his partnership with Mosier, their early attempt at a documentary, additional friendships and movement toward Clerks, early concepts for the film and its growth, financing the flick, casting and auditions, rehearsals and conflicts, technical concerns, shooting and many issues and topics from the set, post-production, receptions and screenings, early failures and gaining exposure, festivals and distribution, and the aftermath. Is “Snowball” the best DVD supplement documentary ever? I don’t know if I’d go that far, but it’s pretty close to that peak. From start to finish, it provides a frank, concise and lively discussion of the movie. It runs through almost every necessary subject and does so in a tight and brisk manner. The program pulls no punches and provides an absolutely terrific experience that thoroughly succeeds. Mae Day: The Crumbling of a Documentary opens with the now standard intro from Smith and Mosier. It lasts 73 seconds before we head to the 10-minute and 23-second short film. Referred to in “Snowball”, this area offers the full piece. When a documentary about a transsexual collapses, Smith and Mosier humorously delineate its demise in this program. It’s a fairly amusing look at early Smith. The 10th Anniversary Q&A fills 42 minutes and seven seconds. It features Smith, Klein, Mosier, Ghigliotti, Mewes, Anderson, and O’Halloran. This go over subjects like the ending, conflicts after the sale of the flick, favorite parts of the flick, the restoration, real-life inspirations, what they got from the experience, Randal’s sexual orientation, challenges during shooting, and earlier relationships. Much of the information appears elsewhere, so don’t expect a lot of fresh material. However, the crowd includes some really annoying fans whose asinine questions clearly get on the participants’ nerves; those moments offer perverse amusement. Next we find a whopping 41 minutes and 27 seconds of Outtakes from “Snowball Effect”. These include remarks from Smith, Flanagan, Anderson, Mosier, film critic Janet Maslin, and Johnson. It also includes some archival moments like Geoff Gilmore’s Sundance introduction of the flick and Smith and Mosier’s acceptance speech. Some of the elements would have fit into the full program, such as Smith’s discussion of casting Lisa Spoonauer and splitting filmmaking duties with Mosier and their relationship, a personal argument during post-production and the whirlwind of activity when Clerks succeeded. Much of it seems tangential and would’ve come across as extraneous in “Effect”. That doesn’t make those comments useless, though, as they provide a lot of cool moments. We hear of things like Anderson’s audition for a live-action Clerks TV show and the creative writing class taken by Smith and Johnson during which they alienated all the other students. A lot more fun material shows up here to make the set good to see. In the Still Photo Gallery, 55 images appear. These mix publicity shots with behind the scenes pictures and even a few childhood snaps of those involved. The Original Kevin Smith Journals split into two areas: “Kevin’s Pre-Clerks Journal” and “Kevin’s Sundance Journal”. The former offer good reflections on the period in question, with a particularly interesting note about how a Quentin Tarantino quote irked Smith. The latter offers a nice snapshot of his early encounter with success; it repeats some information from “Snowball” but still seems engaging and presents the notes in much greater detail. More text appears in Articles and Reviews. This includes eight separate pieces, not all of which directly deal with Clerks. We get the 1991 Amy Taubin article about Slacker that helped inspire Smith as well as another with her early comments about it. Another inspiration comes via an excerpt from a Peter Broderick columns about “no-budget filmmaking”, and we see a later similar piece that directly discusses Clerks. We get an additional review by Janet Maslin, while John Pierson writes about Clerks and fellow Sundance sensation Go Fish. Finally, we discover film festival “program notes” written by Smith and Robert Hawk, respectively. These add up to a nice collection of information. In addition to all these disc-based materials, Clerks includes a 24-page booklet. This consists of many elements. We get “A Word from Kevin Smith” in which he discusses his Quick Stop history and some archival materials for the Independent Feature Film Market and the Sundance Film Festival at which early cuts of Clerks played; we even get to see Smith’s $50 Looney Tunes-themed check to enter the movie at Sundance. A Janet Maslin review of Clerks appears along with “behind the scenes” photos and “A Word from Scott Mosier”. More archival materials like contracts and letters show up plus posters, ads and press kits. It’s a very cool booklet with lots of great pieces. 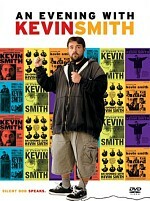 Kevin Smith’s first film doesn’t remain his best, but it offers a frequently creative and clever piece of work. It sets up his style well and despite many flaws, it presents enough strong moments to still work neatly. Though picture and audio remain lackluster at best, they come across as stronger than ever and probably represent the flick as well as possible. As for the supplements, they provide a nearly exhaustive roster of materials that give us a very full vision of the film’s creation and many related subjects. I like Clerks a lot and definitely recommend it. Is it worth it to spend the extra money for this 10th anniversary edition instead of the old one? I think so, at least if you like supplements. While the DVD presents better picture and sound than the cheaper disc, those elements don’t exactly blow it away; it’s always been a cheap looking and sounding flick and always will. However, the extras really dazzle, as they expand on the movie to a terrific degree and offer hours of entertainment. The 10th anniversary release of Clerks earns a very high recommendation and will definitely go down as one of 2004’s best releases.